A few months ago, I started reading through the Gospel of Luke together with two other young mothers, Stella and May. Stella is a confessed Christian, though still very young in the faith. May has been attending churches for a few years, but has still not put her faith in Christ. Both are very eager to be reading the Bible and learning together, which I thank God for. We’ve been reading through two chapters of the Gospel of Luke together every week. One day, I asked in passing how their weeks had gone, and Stella launched into a tirade against her mother-in-law. She had some harsh words to say about her husband as well. Her mother-in-law’s meddling had already brought them to the brink of divorce once, and was threatening to do so again. I panicked. I knew what the Bible said about divorce, but I also didn’t want to scare Stella away on her second week. Still, I had to say something. “You want to look at what the Bible says about marriage?” I suggested somewhat feebly. I decided to stay away from some of the Bible’s very clear passages about divorce, and focused instead on the passages that celebrated marriage as God’s design (Genesis 2:21-24, Ephesians 5:21-33, etc). After all, I didn’t want to come across as judgmental or harsh. Surely, showing her the potential beauty of marriage was the better option, right? Stella nodded along to a lot of what I was saying. “That’s the ideal, isn’t it?” she would agree. But I’m not sure she saw how all these beautiful pictures of God’s covenant heart applied in her own situation. By the time she left to pick up her daughter from kindergarten, I still wasn’t sure I had convinced her of anything. Later that week I spoke with my mentor about this, and she suggested that my responsibility simply laid in showing Stella what the Bible said. After all, God’s Word is “alive and active. Sharper than any double-edged sword, it penetrates even to dividing soul and spirit, joints and marrow; it judges the thoughts and attitudes of the heart” (Hebrews 4:12). I should pray for God’s Word to work in Stella’s heart, but I needn’t try to be a psychiatrist, therapist or anything else that I was not. Ultimately, I was not responsible for Stella’s decisions. But I was responsible for explaining clearly what the Bible said on the topic. With that encouragement, I knew that next time I met with Stella, I needed to go beyond simply affirming God’s design in marriage. I needed to show her the Bible’s equally clear teachings on divorce. I shouldn’t be pushy about it, but neither should I try to tone down what the Bible teaches. As I prepared for our weekly Bible study together, I realized that the chapters we will be reading had a clear passage concerning divorce (Luke 16:18). I marveled at how God provided such a clear opportunity. I wouldn’t even need to go out of my way to introduce the topic. This further encouraged me to give Stella the full truth of what the Bible says on marriage and divorce. During our meeting, May and Stella asked about the passage. We took the chance to also read the first part of Matthew 19, where Jesus explains further. I then simply asked Stella and May what they thought these passages meant, and asked how they thought the passages applied today. I blinked in surprise at the quick change of opinion, but nodded, yes. And again I marveled again at how sufficient God’s Word was. When we faithfully work through God’s Word, instead of just choosing or picking the most familiar parts, God is faithful in giving us what we needed to live a Christian life. Of course, one Bible-reading session is not going to solve all of Stella’s struggles in marriage. But I pray that as we continue reading the Bible together, God will continue to work in our hearts and transform us day by day to be more like Him. Though I have been a Christian for many years now, I am still not confident in my ability to persuade people of the truth of Christ. However, I take comfort in the fact that I don’t have to do all the explaining. Through the Bible, God has given us His full counsel. I simply have to share it with anyone willing to listen. One of the best ways I know to do this is to simply offer to read the Bible with people. 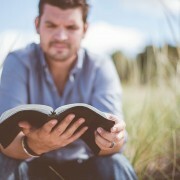 New Christians are often willing and eager to do this, and what better way to grow than to dwell in God’s Word? 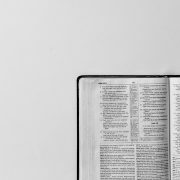 But even for people who might not be interested in Christianity, we can offer the Bible’s wisdom by sharing how biblical principles shape our choices and actions. When walking with others, I really need to be careful that I don’t cushion or hide anything God says in the Bible. Everything He has written—even hard teachings about divorce—is for equipping us. I betray my own lack of trust in God when I gloss over any of the teachings I find difficult. I also do people around me a disservice when I do so, depriving them of the full counsel of God. 2 Timothy 3:16 says, “All Scripture is God-breathed and is useful for teaching, rebuking, correcting and training in righteousness, so that the servant of God may be thoroughly equipped for every good work.” I need to trust that Scripture in its entirety is able to “thoroughly equip” us. That’s an incredibly comforting thought. Even if a truth from the Bible may hurt a friend or family member temporarily, I have to remind myself that it will benefit them in the long run. 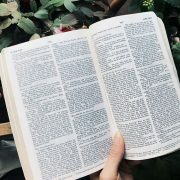 If I’m reading the Bible with a friend and we come across questions, instead of telling my friends what I think, I try to point them to related Scripture that could shed light on the questions. This means looking at the previous chapter or next chapter for context, or sometimes looking up passages in other places in the Bible. This is often, though not always, enough to shed light on our current passage and make the main points clear. And if I am concerned about the way a Christian friend is acting, I often start by asking questions. Why are they doing this? What do they think the Bible says about it? Have they considered this particular passage? And so on. I do this with the hope that we can honestly look at what the Scripture says together, and that God would use His Word to work through the situation. There have been times where Stella, May, and I would understand a passage clearly, but simply found it hard to swallow (Luke 18:29-30, for example). In that case we need to ask for God to change our hearts. At other times, we’d really just not understand something Jesus said or did. When looking at parallel passages or context don’t clear up the confusion, we pray about it, and move on to the next passage. I trust that God gives wisdom to those who ask for it (James 1:5). So we will certainly understand more and more of God’s Word as we mature in our faith. At the end of the day, I’m not the one equipping Stella or May. We are simply reading God’s Word together. I encourage you to read and share the Bible with people around you as well. And I pray that as we faithfully continue to do so, sincerely seeking to understand what God has said for our benefit, then God’s Word will work in our hearts and minds. God reveals himself to us in both the Old and New testaments. He is revealed in every chapter, every paragraph, every smallest letter. Jesus told His followers, “For truly I tell you, until heaven and earth disappear, not the smallest letter, not the least stroke of a pen, will by any means disappear from the Law until everything is accomplished.” (Matthew 5:18). That makes the Bible worth reading.